A computer network administrator at a Columbus, Georgia, hospital is the latest consumer to encounter the flaming laptop syndrome. 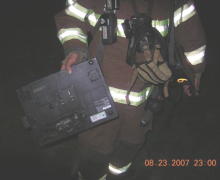 Douglas Brown said his Dell 9200 wide-screen laptop's batteries exploded into flames, it "looked like fireworks which would have been cool had it not been in my house." Brown called 911 and the fire department responded with two pumpers, a ladder truck, the HAZMAT unit, an ambulance and the battalion chief. "Way too much manpower for one little laptop," he said, but "I guess it sounded like it was more then it really was" to the 911 dispatcher. It's the latest in a series of fires and meltdowns involving the lithium-ion batteries used in laptops, cell phones and other electronic devices. 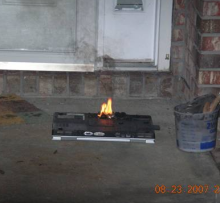 Last year, a man in South Venice, Fla. blamed his Dell laptop for burning down his house. Earlier this year, a Macbook was blamed for a house fire in Australia. In one of the most celebrated cases, a Dell laptop was blamed for setting fire to a pickup truck parked in a remote mountainous area in Nevada last August. The fire not only destroyed the truck but set off a box of ammunition its outdoorsman owner had left in the glove compartment while he went fishing. Dell and other computer makers have recalled millions of batteries. It could not immediately be determined whether Brown's laptop was among the recalled units. Brown said he called Dell and spoke with a representative named Cory who was "very nice and professional" but who then transferred him to someone who was not. Brown said he asked the next service rep "who was going to pay for the damages to my house and the HAZMAT bill and (she) asked me if I had insurance. "I would have thought Dell would have had a better answer then that," Brown said. "After all the fire was caused by their computer." Brown said the laptop is now sitting the middle of his driveway.